This Vegan Cheesy Scalloped Potatoes recipe may be one of the easiest side dishes you’ll ever make! 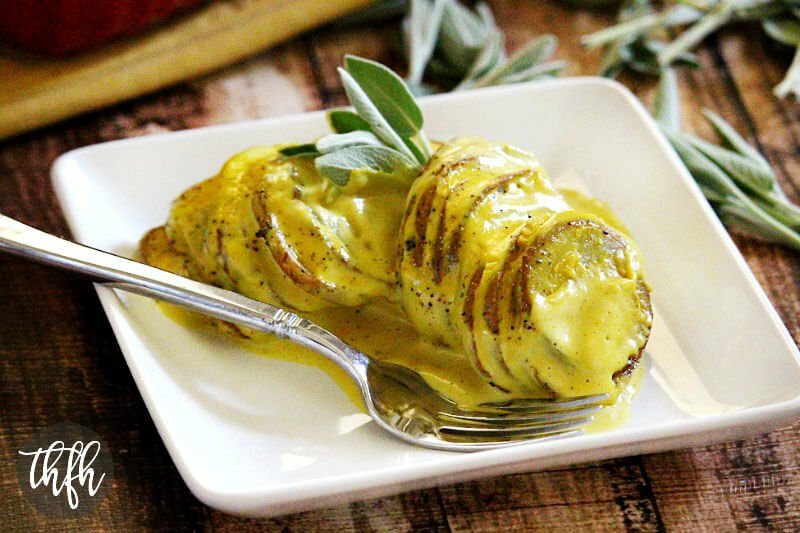 It’s really simple – start by slicing the potatoes, baking them in the oven until the edges are golden brown, then covering them with a creamy vegan “cheese” sauce you can make with a Vitamix in less than 5 minutes. Garnish the top with fresh sage, rosemary or tarragon and, you can even turn it into a meal by adding diced onions and vegan sausage slices (like Field Roast) in between the potato pieces (recipe for that coming soon!). Traditional scallop potato recipes use lots of butter, milk, cheese and even white flour. This healthier version is organic, vegan, gluten-free and dairy-free. Want more healthy side dish recipes? 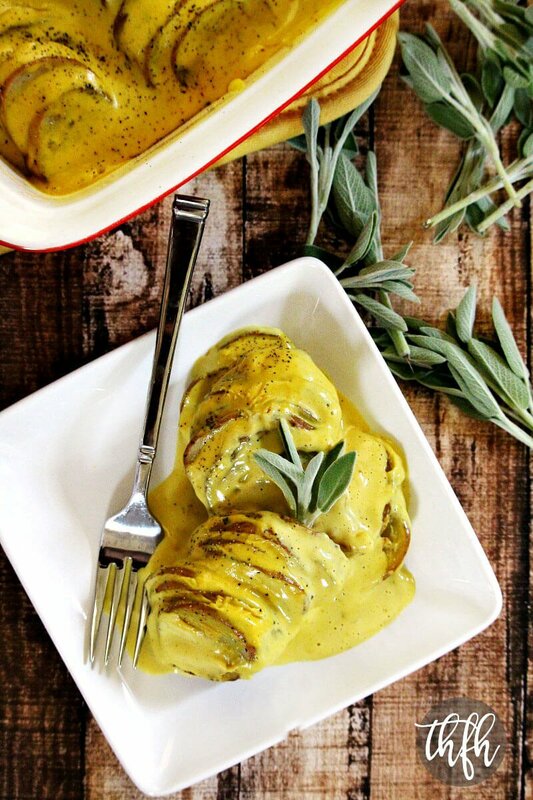 Check out Spicy Twice Baked Turmeric Potatoes, Rosemary and Garlic Maple Glazed Carrots, Clean Eating Roasted Vegetable Medley or my Clean Eating Cookbook with an entire chapter of 20 healthy snack and side dish recipes just like this one that you will love! Tip #1: I used “red potatoes” but feel free to use your favorite variety or whatever you have on hand. Tip #2: I used homemade almond milk, but feel free to use your favorite unsweetened non-dairy milk as a substitute. Tip #3: I added the ground turmeric to give the sauce a “yellow” color but you can omit it if you don’t have any. Step 1 Wash and dry the potatoes, then cut into thin slices (leaving the skin on). Add the sliced potatoes, avocado oil, Himalayan pink salt and ground black pepper to a large mixing bowl and toss until everything is evenly distributed and well combined. Fill an 8 x 8 baking dish with the potato slices; making three rows and stacking the potatoes in each row in an upright position (like dominos). Bake at 375 degrees for approximately 45 - 60 minutes, or until they are soft. The baking time can vary and will depend on how thin / thick the potato slices are, but you only need to bake them until they are soft. While the potatoes are baking, add all ingredients for the sauce to a Vitamix, or high speed blender, and blend until everything is well combined and smooth. Adjust seasonings to your preference. Set aside. When the potatoes are ready, remove them from oven and immediately pour the "cheesy" sauce over the top while the potatoes are still warm. Optional: garnish with fresh chopped sage, rosemary, tarragon or ground black pepper. The recipe and photographs for "Vegan Cheesy Scalloped Potatoes" by Karielyn Tillman of The Healthy Family and Home website are licensed under a Creative Commons Attribution Non-Commercial-NoDerivatives 4.0 International License and cannot be used without my written permission.